Updated 9:22AM, Wednesday October 17th, 2012	by Sam Hailes, Christian.co.uk Be the first to comment! Billy Graham’s son Franklin is everything I imagined. Firstly and most obviously, he’s passionate about the gospel. He may have been standing in front of predominantly Muslim school children from the East End of London, but that didn’t stop him preaching Jesus Christ as the Son of God and the Saviour of the world. In fact, you get the impression that nothing will stop Franklin Graham from preaching the gospel, and when he ends our interview by quoting Paul’s words “I’m not ashamed of the gospel…” you know he means it. Franklin was using his rare visit to the UK to raise awareness about Operation Christmas Child (OCC) – a project that will see 8 million children in extreme poverty receive a shoebox full of presents around the Christmas period. The project was founded by Welshman Dave Cooke in 1990. Five years later, Dave called Franklin Graham and asked him to collect shoeboxes in North America to be sent to Bosnia. When Franklin says God has blessed it, he means it. According to the famous preacher, OCC is now the world’s largest Christmas program. Samaritans Purse have also developed a discipleship program to accompany OCC. Titled The Greatest Journey, Franklin has big plans for the course. Franklin believes the key to the success of OCC is prayer. He even goes as far to say he’d rather 100 boxes with prayer behind them than 10000 boxes with no prayer. Distributing 8 million boxes is a tough task to say the least. Franklin explains each box has to organised by gender and then further segregated according to age group. But with each box often impacting and blessing an entire family, Franklin has seen first hand the fruit of the charity’s efforts. For example, two years in Albuquerque Franklin was speaking at a large church. In between services, the pastor introduced a young girl to the preacher. “This girl came and was kind of shaky and was nervous speaking to me. She said 'a few years ago I was a Bosnian refugee at a camp in Croatia and we heard some people were coming with gifts for children. We were so excited we could barely sleep. “The next day you didn’t come. And the next day you didn’t come. About a week later the trucks showed up and Mr Graham you came. I stood in line with all the other girls, I remember I got my box and I ran back to my tent. We hadn’t bathed for several months and everything smelled. I went back and I opened my box and everything smelled so clean. There was a doll and I still have it today. There was a wool hat and I put it down over my ears and it was so warm. There were mittens and my hands were so warm. Determined to get the shoeboxes to where they are most needed, Franklin was planning how to get a container into Syria just hours before speaking to me. And while the project has in the past gained support with everyone from Mr T to Alan Shearer, OCC has also had its critics. “I’ve had some skeptical reporters from time to time,” Franklin says smiling. “They’ll try to intimidate you sometimes and say ‘you mean to tell me that you’re using these gifts to proselytize? !’ The way they say ‘proselytize’ they make it sound so terrible. I say ‘yeah’. They looked shocked that I’d admit to it. “I say ‘we want to make Christ known. I want every child to get a box and know that God gave his son to for our sins. He can come into the hearts of all of these children.’ They look at you in disbelief. Then I’ll say ‘you know it is Christmas?’ and they look at you puzzled. I say ‘it’s Christmas we’re celebrating the birth of Jesus Christ, of course we’re going to tell these children about Jesus Christ!’ and they go ‘oh’ and they haven’t thought of that! When I ask about Franklin’s new book, he looks thoughtful. “Which one is that?” We laugh as he apologizes he’s been so busy with OCC he hasn’t spent much time talking about his books. I jog his memory. 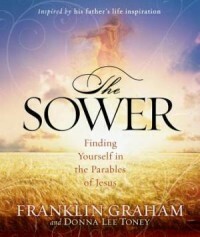 It’s called The Sower. “It’s written as a devotional and an easy way to read and understand that parable that is of profound importance. We don’t know as we go through life and take God’s word and share it – sometimes his word falls on shallow ground. Our job is to be faithful and not to be discouraged. “We live in a very secular society. Growing up as a child we were always afraid of communism. NATO built up its forces and everyone was facing the red threat coming from the East. When the Iron Curtain came down secularism rose but we didn’t pay much attention to it. It's obvious that Franklin isn't just the son of a preacher man. He's a preacher himself, and a convincing and passionate one at that!